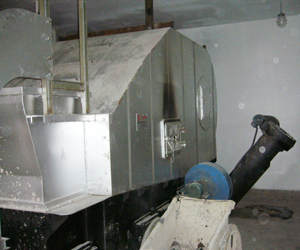 RSL-I series stove adopts wood block(less than 50mm),wood pellets and shells for fuel,being equipped with automatic stoker .Clean hot smoke&gas is obtained through two-grade burning and two-time dust filtering.And the stove is widely used in the drying of inedible materiels,such as saw dust,seeds,feedstuff,chicken manure,dregs,foundry sand,and so on. a.Auto fuel elevator:be in front of stove body,consisting of fuel bucket,guide rail frame,support flate,elevating machine and gear box.The function is elevating fuel bucket automatically and dumping the fuel into fuel box. b.Auto fuel feeding machine:drives fuel into stove body.There are four separate air chambers under the fire grate.Different fuels will burn sufficiently by adjusting air volume of each chamber through handwheel.Soot doors are adopted. 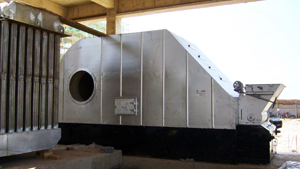 c.Stove body:consists of fire grate assembly, primary chamber and secondary chamber.The inside of fire chamber is refractory concrete,also adopts fuel flashboard to adjust the thickness of fuel bed.On both the left side and right side of primary chamber there are fire doors for igniting and observing burning circs,also moving coking fuel bed for sufficiently burning.Secondary chamber has fire bar,ash passage and inspection hole.A quantity of combustible gas, such as CO from primary chamber will be burned sufficiently n secondary chamber.Double grade cyclone dust filter in sencondary chamber will purify the smoke&gas. Moment adjustment is carried out by rotating air cover on the exit of secondary chamber.Stable adjustment need to change fuel feeding and blast volume.Shorten time interval of fuel feeding or increase feeding amount,then the temperature rises.Or vice versa. Feeding interval could be setted between 0~5minutes.The temperature of output gas could be controlled at 800°C±20°C.The stove is under micro negative pressure in normal running.The surface temperature won’t be 30°C higher than indoor temperature.